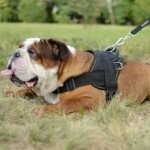 Hardware for dog collar is one of the main points you need to draw attention to when choose English Bulldog dog collar. 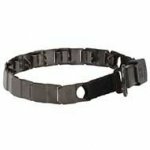 Not every metal and alloy is solid enough for long-term use of a collar. 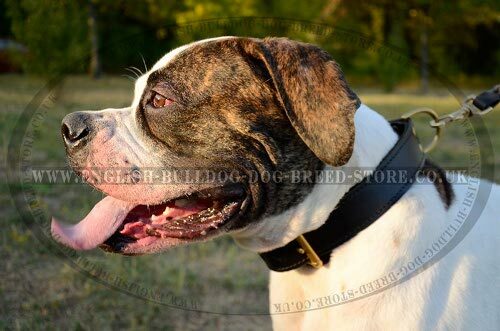 Quality dog collar hardware for English Bulldog collars is made of chrome-, nickel-plated steel and brass. 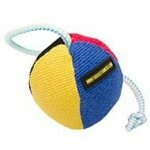 Let's find out which one to get for your Bulldog? Chrome-plated fittings are glossy and nice-looking. Chrome-plated steel is the alloy, which can become rusty under the influence of water. High-quality details are protected with double coating: nickel first and then chromizing to provide maximum protection from corrosion. The details of chromized steel are sturdy and extra-strong. 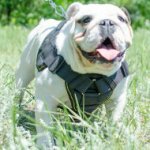 If your Bulldog's coat is tend to be colored of metal details, it is better to choose the collar with nickel-plated or brass hardware, which will be probably more suitable for the pet. 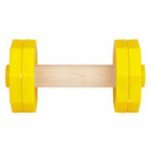 Nickel-plated steel details are solid and break-resistant. 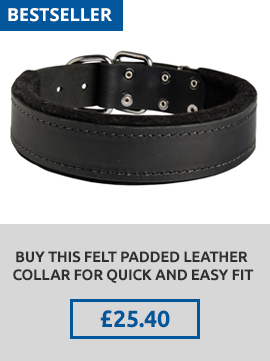 They look like being made of silver and add stylish look to a collar. Nickel covering adds more durability and makes steel rustproof. It prolongs service life of the hardware and keeps its decorative appearance. 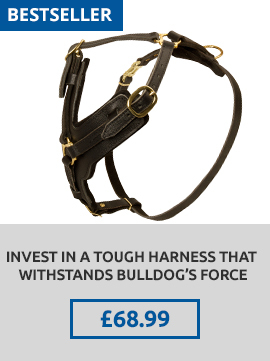 Nickel-plated steel fittings won't damage under pulling strength of Bulldog. 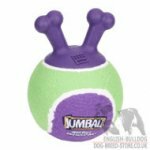 They will provide reliable control over the dog during its daily activities. The metal won't color Bulldog's coat. 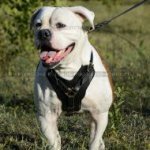 You can purchase the collar with nickel-plated fitments and adornments with no doubt if the dog is not allergic to nickel. 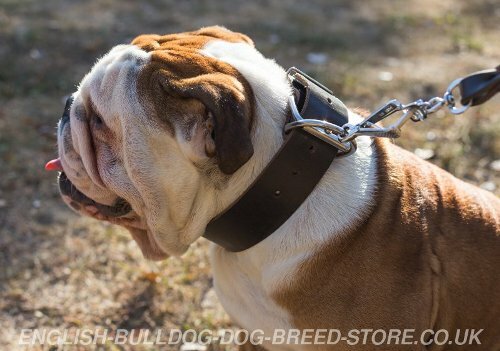 It is recommended to choose dog collar brass hardware if Bulldog has allergy. Brass is the alloy of copper and zinc. It shines like gold and the collar with brass fittings has attractive and rich look. Brass contains no nickel and is hypoallergenic. 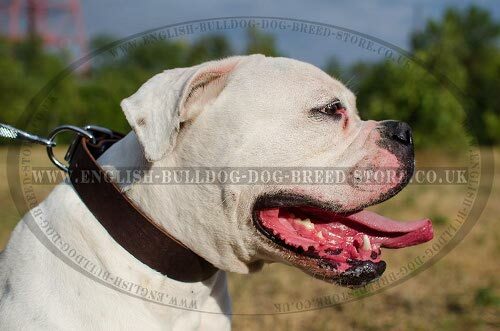 It doesn't cause discoloration and suitable for Bulldogs with sensitive skin. Metal details of this alloy are high-tensile and rust-resistant, but they are darken with time under long-tem effect of wet and air. It is advisable to cover brass fitments with clear varnish to keep their shiny look. 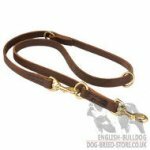 All the fitments we use for our collars are weld, apart metals they are made of. 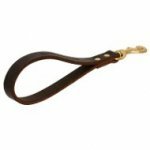 If you are in search of the collar for everyday use, the one with nickel-plated or chromized fittings will be suitable. 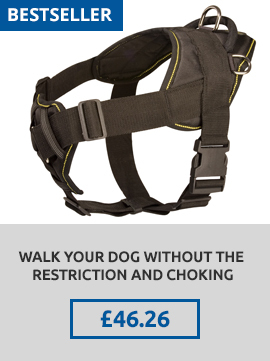 The collar with brass hardware is good for dry weather and climate.